Okay, so this comeback post stands for all Harry Potter fans like me. I'm an ardent lover of that magical wizard. And so I guess is every second person in the world!! But do any one of you know much about the unique and miraculous author, J.K Rowling? J. K. stands for Joanne Kathleen. 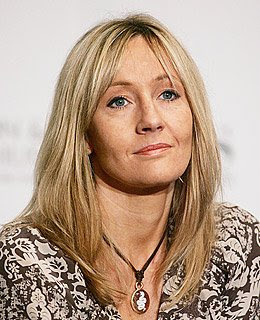 J. K. Rowling chose to use her initials for the book because her publisher feared that if readers knew she was female, the boy wizard, Harry Potter, would not gain as much fame as it deserved. Of course, everyone later learned this was hardly the case. And I wrote a post about it too. You can read it here, Female Writers Won't Appeal To The Masses! The interesting thing is that the extraordinary story of the magical wizard was created quite normally, like every second struggling writer.....that too, on napkins!! Yea! She wrote the story of Harry Potter while travelling on train being a single mother then. J.K Rowling was not born with a silver spoon in her mouth. Beleive it or not, the richest author in the world was an ordinary woman at a time. She completed her first book-length manuscript on an old manual typewriter while she was unemployed and living on state benefits. It is known that about twelve publishing houses initially rejected her first novel, Harry Potter and the Philosopher's Stone. A small publisher, Bloomsbury, in hope for some job, finally decided to give Harry Potter and J.K. Rowling a break, even giving the author a small advance. But that small advance was quite a big turnaround for her, after the success of her books. In 2006, the author was named the second richest female entertainer in the world behind Oprah Winfrey. Her fortune is around over One Billion U.S. Dollars. It is recorded, even in the Guinness Book of World Records that her sixth book of the Harry Potter series sold more copies in twenty-four hours than The Da Vinci Code sold in a year. Any guesses how many copies were sold, or how much money she earned every twenty-four hours?? My head turns just imagining so! After that, as we all know, J. K. Rowling has assured the world that the seventh book in the Harry Potter series will also be the last. Many famous authors like Stephen King and John Irving have begged J. K. Rowling not to finish off the dear little boy wizard but unfortunately, for all of us alike, she has been sure footed about his destiny. J. K. Rowling, a modest woman, even contributes a good deal of money and supports charitable causes. She has even suggested to publish an encyclopedia about the magical world of Harry Potter, and contribute all earnings from the publication to charity. Was it not wonderful to know about this great personality? And if you know any additional information about her, please feel free to share it with me! Vocabulary plays the principle role in helping you emote your expressions on paper. It certainly plays a pivotal role in building up a good and interesting piece on paper. But it certainly is a tension….thesaurus and dictionaries do help you and can remain with you forever but will it not be more prudent of you to develop a good vocabulary and leave an indelible impression about your character to a person you talk?? So today I have some places on the World Wide Web which might help you improve you vocabulary. 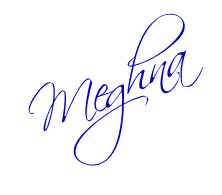 And please remember to drop back here and give me feedbacks too…..so here you go. Write101.com is an interesting read which gives you links for the fastest ways to improve your word power and also tells you why it is necessary. There are some links at the end of this page which one might find really useful. An excellent page which might help you is GRE Vocabulary Builder which might really play a key role in helping you qualify! Another page which gives you information bout the tools you can use to improve is Improve Vocabulary. This is a page about how you can improve your vocabulary to talk smart! You surely cannot miss this one. Also check out the post Power Words which certainly qualifies for an interesting read. Hope you all can benefit from browsing through this wonderful site. Edgar Allan Poe -Kicked out of Military Academy! Who has not heard of Egar Allan Poe??? Everyone has, irrespective of being a literature lover or not! But did any of you know him as a Sergeant-Major? It's true. Poe already had published his first volume of poetry, Tamarlane and Other Poems, when he joined the U.S. Army as a Private in 1827. So what with it, eh? Apparently, the next year, in 1830, Poe secured an appointment to West Point. Poe excelled in his studies at first, but after an argument with his adoptive father, John Allan, Poe apparently let his studies degrade deliberately. After a court-martial in January of 1831, Poe was dismissed from the academy and from the army. Edgar Allan Poe's classic poem "The Raven" talked about his reputation as a black-feathered literary master of the macabre. Later, Poe mixed poetry with work as a soldier in the U.S. Army. He was dismissed from West Point and moved to Baltimore, Maryland, where he began writing prose. 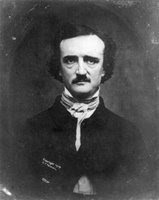 Poe wrote for various magazines in Richmond, Philadelphia and New York, and also published creepy short stories and poems, including "The Purloined Letter," "The Tell-Tale Heart" and "The Cask of Amontillado." His story The Murders in the Rue Morgue is widely considered to be the first modern detective story, with Poe, later emerged, masters of the craft like Sir Arthur Conan Doyle and Agatha Christie. Being a heavy drinker and smoker, Poe was never in robust health. Poe thus, died under mysterious circumstances at age 40 after visiting Virginia to lecture. He was found languishing on the street in Baltimore and taken unconscious to a local hospital, where he died. Now, as I say….life histories about writers are always interesting and Edgar Allan Poe’s biography is one of the most interesting of all others! Hope you enjoyed reading and please pardon my for a while for not posting regularly for me exams are around the bend…..But I promise to be back soon!!! I had a chapter while in junior school adapted from one of the stories in the book 'Three Men In A Boat- by Jerome K. Jerome'. And I remember how it had fascinated me, thus I vowed to read the whole book. And I was overjoyed when I could lay my hands on it. Jerome K. Jerome has a sense of humor much possessed by modern writers but lost in the old ones. 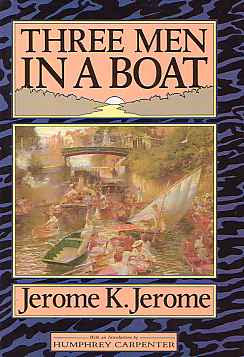 The book is based on the adventures of the three friends (Jerome, George, Harris- not to mention the dog, Montmorency ) on the river Thames, between Kingston and Oxford, in a boat. He wrote it after returning form his honeymoon where his wife was replaced by his friend George Wingrave (George) and Carl Hentschel (Harris). This allowed him to create comic (and non-sentimental) situations which were nonetheless intertwined with the history of the Thames region. And as I told you, the humorous element has the whole charm in a book which is missing in all classic books. The jokes seem fresh, relevant and witty even today. The adventures of the three friends are all real but the dog, a major part stands fictional but according to Jerome his emotions and a tad bit of biography of his lies within the part of the dog. The journey has many funny and sentimental instances of their adventures. It is a purely enjoyable book for every book lovers, and in that I do not deter from saying- modern. The incidents in the book seem really authentic which helps the reader connect. Though, I do not blame you if you get bored of reading it after a while. As all old writers, Jerome too has the habit of accentuating minor points and increasing the length of the story. But I know you’ll be tempted to read on. So go, grab a copy, immerse yourself and have a good laugh and enjoy yourself.